Wow! It’s been Eleventeen days since my last post. Doesn’t seem like that long so it’s apparent that I don’t remember all of them. I do remember going to Costco one day to buy some stuff. 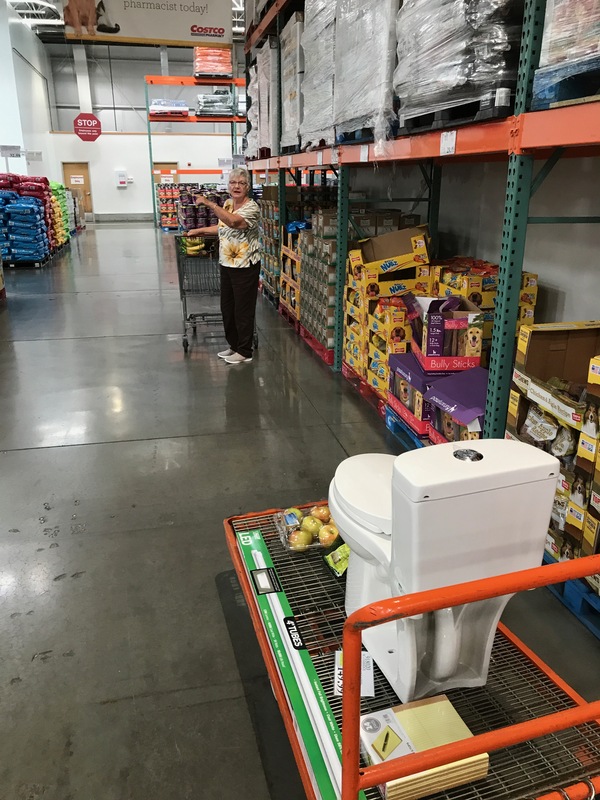 I picked out a new toilet that was conveniently sitting on one of those pretty orange push things and no one was around to claim it. So, I just rolled it away and found Diane. As I followed her around the store I’d get an occasional, “Can I help you?” from Costco employees. I got tired of saying “no” all the time and switched to “no, my wife has diarrhea and I have to stay close to her until she’s done shopping.” It wasn’t long before I had 5 or 6 of them following me to see what was going to happen. Little did they know that they were wasting their time because that was days ago and the penalty won’t be enforced until later today when she reads this. Another interesting aspect of my life that involves change is that Diane has started issuing me one pair of underwear at a time. I don’t get a clean pair unless I have a used pair to trade. Normally that doesn’t bother me but penalties for non-compliance are reportedly going to be severe for future infractions. I probably shouldn’t have turned in my last used pair without letting her see them first because now I have none. Guess I won’t be wearing jeans today. Oh, and I got my stitches out. Too bad we’re not a little closer to Halloween. I also went golfing with the Peal Boys even though the humidity was 100%. It wasn’t raining, just a little foggy. 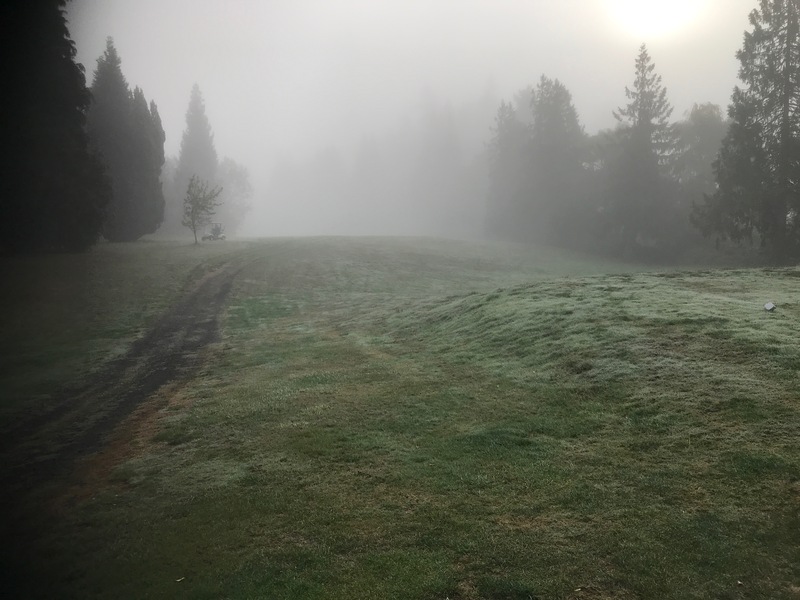 Added a challenge for finding the balls once they were hit because until we got to the 6th fairway, we couldn’t see them land. Just old guys having a little fun. Now it’s time for me to fire up my table saw since Diane left me unsupervised again. I admit I received some explicit instructions but forgot most of them during the 10 minutes drive home. The main one is “no power tools!” We’ll see how that works out because I have a bunch of baseboard parts to trim. It has begun. Diane’s been wanting the hall floor to go away since the day after we moved in (10 years ago) and it finally made it to the top of my To Do List. As most of you probably already know, TDL’s are a living document, subject to change at the drop of a hat, or at the hint of a whim. Mine is always in flux. Replacing the hall flooring made it to the top because Diane thinks we should sell the house and move into the RV. That means we must fix everything up like brand new for the new owners. 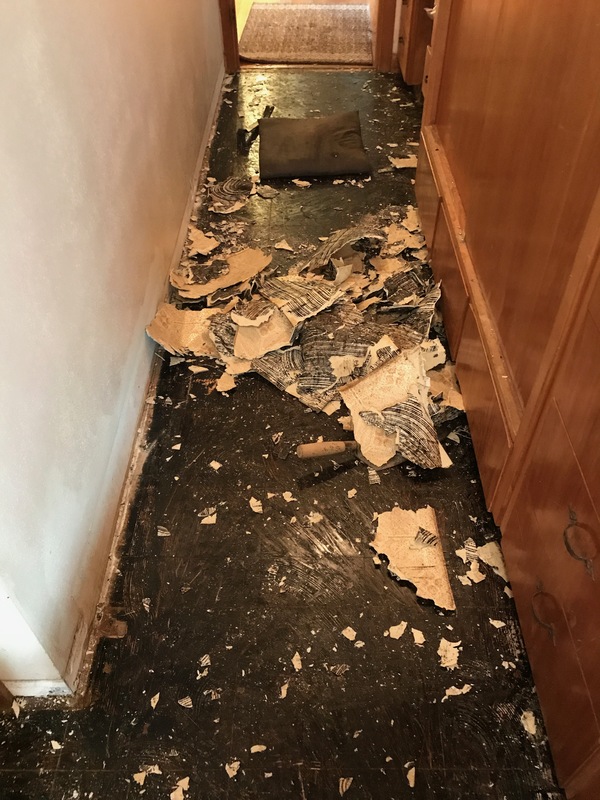 There is one layer of linoleum and two layers of tile that need to be removed. 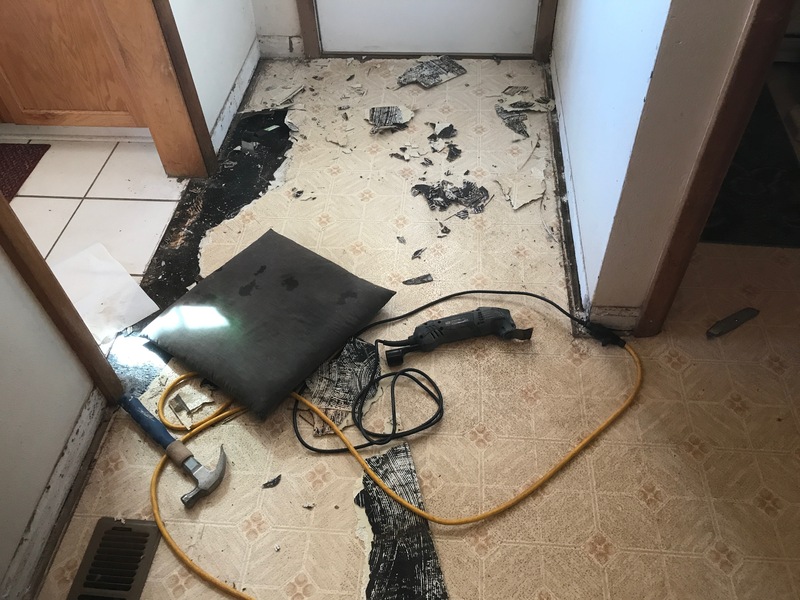 The original 1957 tile is the bottom layer and I’m determined to remove it to ensure the floor is level at all ingress and egress points in the hall. There are six of them. In order to remain true to my tradition of doing stuff like this, I’m using the wrong tool, but it’s working. I would use the right tool, but I don’t have one. What I have it a flat pry bar that has a very sharp edge, allowing it to slip easily under the tile so it can be pried up. Maybe I do have the right tool, after all. Thankfully, I’m medically trained to recognize signs of injury and what to do when they are discovered. Not only is this the sign of an injury, it’s also a reminder that I should be wearing gloves. The blood is just a little bit of what I lost when my hand slipped from a piece of tile I was trying to pull out and the knuckle of my wedding ring finger grazed the sharp edge of my pry bar that was obviously laying in the wrong place. I didn’t know the extent of the damage at the time it happened. It was just an ordinary random pain I get when I do stuff like this so kept on working. 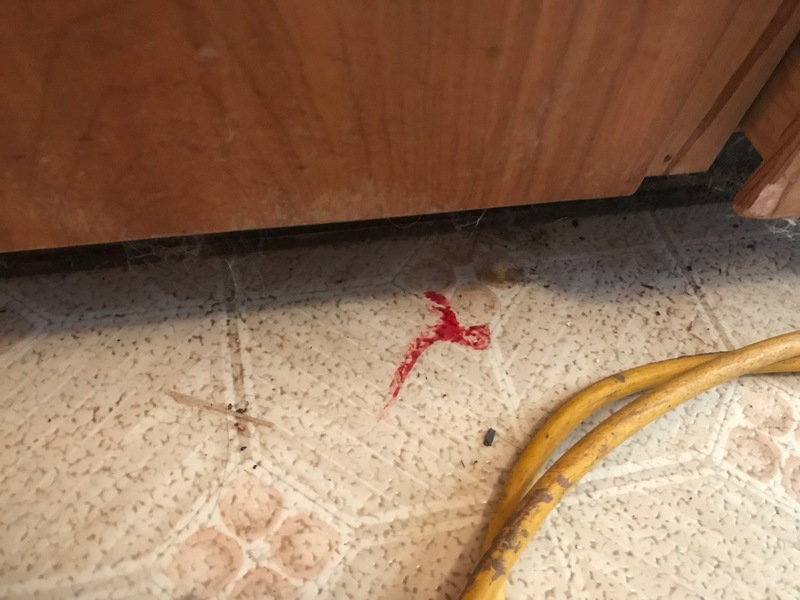 When I saw the blood on the floor my training kicked in, causing me to react very quickly to determine the source of this vital fluid by checking the exposed portions of my body for leaks. Once found it’s a simple matter of getting a paper towel wrapped around the injury, if possible, then going meekly to Diane for assistance to seal the wound. Her response, pretty much every time, when she sees me standing in front of her holding a paper towel to some part of my anatomy is, “Oh Lord, what did you do now? !” I know it’s a rhetorical question because she just heads for the band aid drawer without waiting for an answer. Yes, we have an entire drawer that’s used only for band aids. For the past month or so, Diane has been battling bronchitis. She’s had a horrible time with it and it seems to happen every year at this time when things turn really wet outside. It’s always a concern for me because when she’s making me a sandwich and coughing I fear that I may be the next victim. So far that hasn’t happened, probably because I convinced her to visit her doctor a couple of weeks ago and she got some antibiotics to help her fight this. After three days on the antibiotics I was confident that she was no longer contagious and allowed he to resume her sandwich making duties. She’s been slowly improving since then and is almost back to her normal self. Yesterday she had her followup visit with the doctor to see how things were going. After she left I got to thinking that it’s been a number of years since I had my last tetanus shot. Now, that’s not normally something I think about, but it gave me something to consider as I went down to my shop to continue work on a couple of projects I have going for Christmas. Within 10 minutes, during which time I was able to make a series of boards, with angled edges of precisely 11.5 degrees, on my table saw. 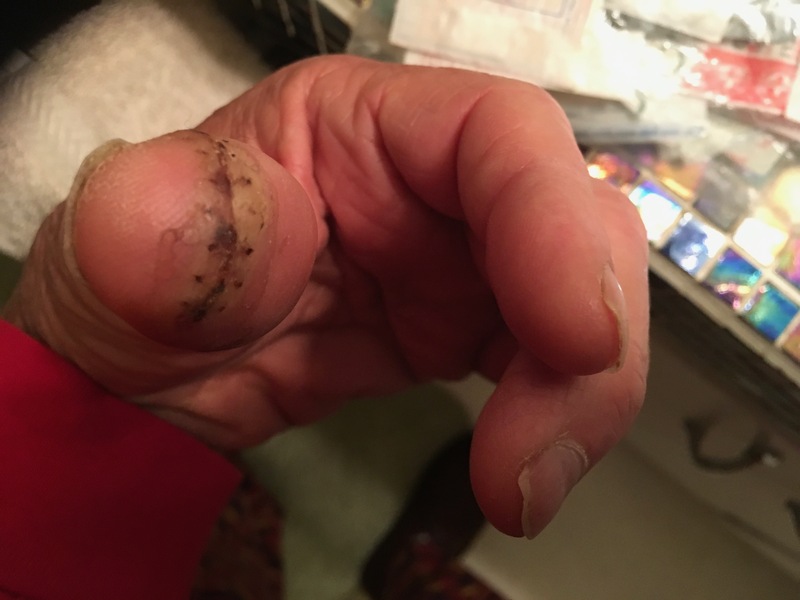 On the very last cut the table saw snatched the perfectly good leather glove of my left hand and gnawed a large chunk from the forefinger area. Due to the pain which accompanied the destruction of my glove I was pretty certain there was physical damage involved. My well honed reactions to events of this nature cause me to make a tight fist of my left hand and clutch it to my chest in a manner that, had anyone been present, may have indicated I was suffering a cardiac event. Because I had my left hand clutched to my chest I decided that I didn’t want to fuss over how to get my seat belt strapped around me so, throwing caution to the wind, headed down the hill without it. It feels really odd to drive without a seat belt. It’s just not normal. But I did it. Instead of going directly to the emergency room, I parked by Diane’s truck on the other side of the building thinking she would know something was up when she saw my car. To ensure there was no confusion, however, I went into the reception area and asked one of the ladies to please give Diane a message about where I was so she would know why my car was there. Then I walked around the building to the emergency side of things. Walking into the emergency room with my hand clutched to my chest, I knew, would create a stir, so I just said “table saw”, to the first person I saw so they wouldn’t get the wrong idea about the reason for my visit. Those two little words granted me front of the line priority and, after a very brief check in, I was rushed to a room beyond the normally locked doors where things happen. Since I’ve done this before, a number of times, and most recently for the same finger, I know the procedure, and most of the people helping me. I assumed a prone position, in my well used work clothes, on a nice white sheet, then opened my fist so the nurse could get the glove off and check the damage. From precious experience I knew that my clutching method would stem the flow of blood to a minimum so wasn’t surprised when none came pouring out when the glove was removed. Notice the nice 1/8″ kerf. Since I’d never seen the interior of my finger before, I was quite fascinated. A nice young lady, who claimed to not be a doctor, but a PA, checked out my wound and determined that she could save it. During her investigation, she asked about the status of my tetanus vaccination and I reported that that particular shot was one of the reasons for my visit because it’s been about 7 years since my last one and figured another one was due. Oddly, that coincided with my last visit to that same room, for issues with the same forefinger.Then she gave me a shot to deaden the finger, telling me I’d feel a little pinch when she inserted the needle. I assured her, when it was done, that what I felt wasn’t too bad, but it certainly wasn’t like a pinch. She laughed. Then my finger went to sleep before the pain took over my senses. Diane arrived to keep me company around this time and I was happy that she wasn’t mad at me. And, she had good news that, though she had infection in her eustachian tube, the bronchitis was much better. I love being with my wife, even in an emergency room. Actually, the most severe pain was at the moment of impact with the saw blade as I felt each tooth tearing into my finger as it spun. Nasty. Still, it was nice to have it numb. Then one of the nurses came in and administered the new tetanus shot, in my right shoulder area, after which another nurse arrived with equipment she used to scrub the be-Jesus out of the wound, ensuring there were no stray little bits of leather or wood chips hanging around. I didn’t watch because I knew she was doing a very thorough job and I didn’t want to vomit on my chest. It wasn’t until then that my right shoulder began hurting a little from the injection. When the scrubbing was done, the PA returned with the stitch kit she needed to repair the damage. As she entered, the lights flickered a bit, and everyone was commenting about the odd smell in the air. For me, it had a distinctive bakelite smell indicative of some sort of electronic equipment failure. My friend, “The Plant Electrician”, is no doubt well acquainted with that telling aroma. 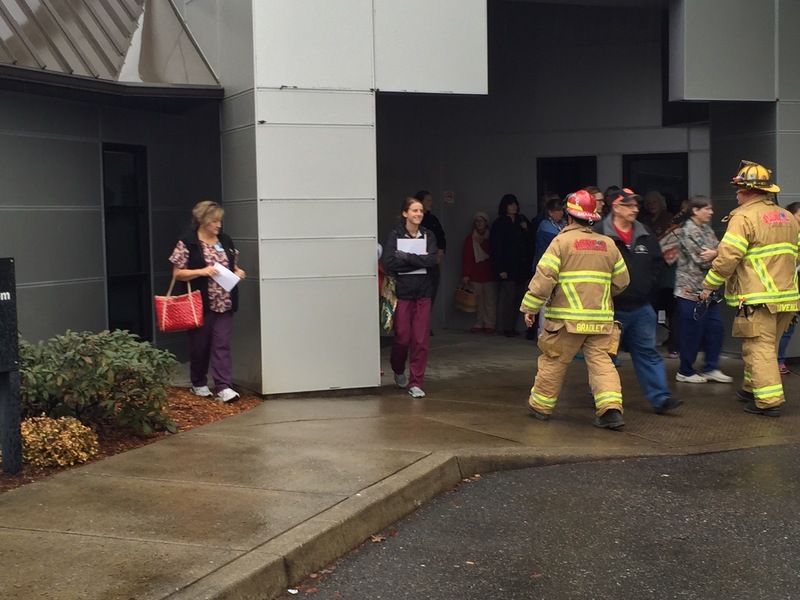 After a short time the fire alarm sounded and everyone vacated the building, out into the rain, to await the fire department. A nurse quickly wrapped a bunch of gauze around my finger and Diane went to get her truck to bring it around so we could sit and wait. I was thankful for that as I watched everyone huddled outside in the rain. They could have gone to their cars, too, but they didn’t. 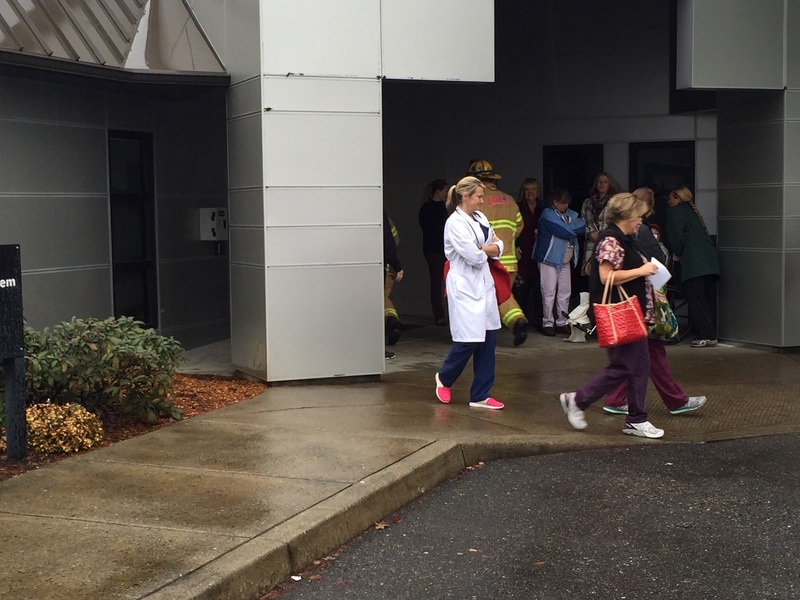 … and they shooed everyone away from the building, out into the rain. Apparently standing under the shelter of the entry area wasn’t a good idea. So, everyone left, but we were allowed to stay, sitting in the truck. That’s my PA, Kimberly, in the white coat. In front of her, is another Diane that I’ve known a long time, and to her left is Kimberly’s scribe, Beth. I don’t know where they went, but I regret not offering them all a seat in the truck to await the outcome of this event. I’m sure Kimberly could have stitched me up while we waited. Finally, after about an hour, long enough for my finger to heal, we were allowed back into the building where we assumed our previous positions. Mike, an ex Navy Corpsman, provided us with warm blankets which felt really good. After everything settled down, and things were moving back to normal, Kimberly reappeared to resume her task. Because of the delay in finishing the procedure, we both thought it would be a good idea if she added a bit more numbing agent before getting busy with the stitches. While doing so, I learned from idle chatter in the hallway that I was the cause of the need to evacuate because everything was going just fine until I got there. Having broad shoulders, figuratively speaking, I figured I could accept that responsibility and ease the burden a little for the real culprit who drove his vehicle into a power pole somewhere nearby. 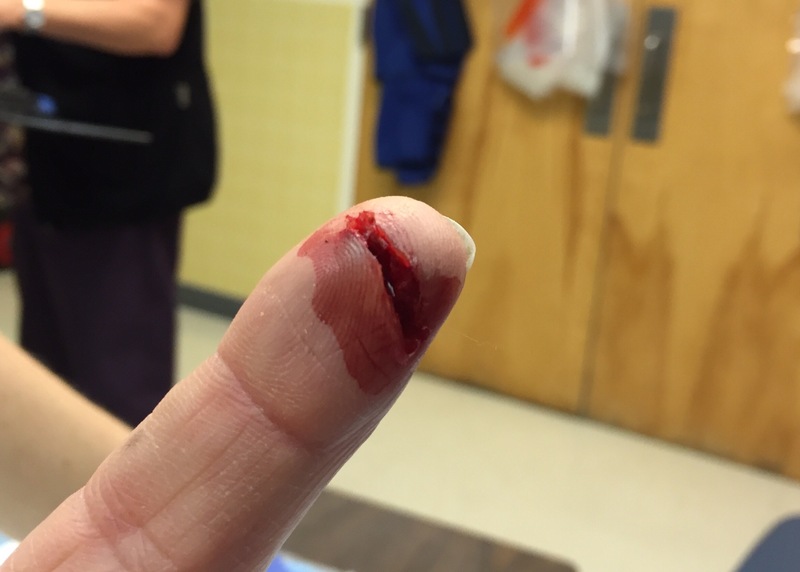 Six stitches are now holding my finger together. That makes 21 stitches total for that one digit in its lifetime. None of its neighboring digits have ever been stitched up so it has the record, hands down. I sincerely hope every one of you who have suffered through this narrative are in good health and will continue to enjoy that state of being for the remainder of your lives. Today I woke up perky, ready to be productive and it was a good thing because the cat was sitting on my iPad which kept me from lounging on my recliner until just before noon. Like I did yesterday. Diane woke me up with just enough time to eat something and shower up for my 12 o’clock dental appointment. It was a restive morning. On the way home I made a couple of stops. One was at the local Chevy dealership where I spoke briefly to Skip, one of the salesmen, to share the good news that our friend Barb was extremely pleased with her buying experience the previous day. It’s not something I needed to do, but I wanted to check with him to find out if he, or Jeff, the Manager, was the person who would authorize my 25% deduction on my next purchase for the referral. Without skipping a beat he said to talk with Jeff. He was busy, so I went on about my business. I’m guessing a 25% savings on a new vehicle is a pipe dream … another delusion. I’m going to ask anyway. Another stop was at a high level relative’s home where I inquired about the mantel clock that used to belong to Diane’s Grandparents. I figured since Diane now has a fireplace mantel, she should have a mantel clock, something she’s wanted for many years. I was pleased that the clock was placed into my hands for transport to my lovely bride. It’s for her birthday. Actually, the mantel was her birthday request, the clock was icing on the cake. I’m taking it to a master clock person to have it cleaned and tweaked, but wanted to share it with her first. It was a special moment. One of those moments where tears of joy flowed freely, bringing many fond memories to light. Doing things like this isn’t in my nature because I typically don’t think about doing them until the last-minute, or not at all because I was distracted. To have figured this out all by myself, and to follow through, pleased me immensely. There’s still hope for this old codger. Sadly, the mantel is about 1/2 inch too narrow to safely hold the ‘new’ mantel clock which means I will have to redo it, or build a classy shelf just for the clock. There is a solution out there somewhere. For the record, Diane cried when I showed it to her. She’s a happy camper. 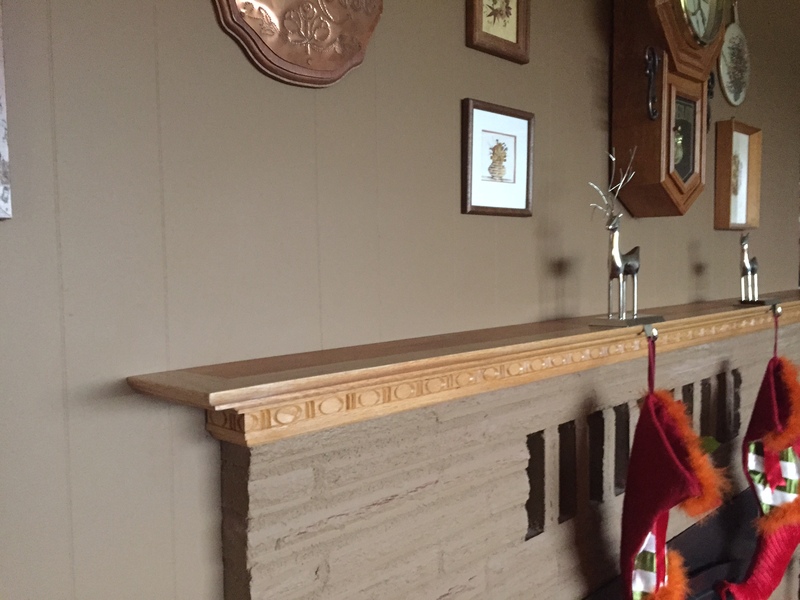 Here’s what the mantel looks like at the moment. It may change. We’ll see. Now I must don my work clothes and get to work at something strenuous because my BS Meter tells me I’m running at 216 which is too high. Must have been the coffee. Yesterday afternoon I only had two things to remember; put the garbage can, and the recycle can at the street. Technically, I suppose that’s only one thing to remember. Also, technically, neither of them are cans, but it doesn’t sound right if you call them ‘plastics’, ya know? So, they’re cans. I knew right away I’d missed the garbage man when I frantically rolled the can to the street when I woke at 0710 because the neighbors garbage can lid was upside down, the garbage man’s way of saying, “I was here.” Still, I left it at the street with the plan of hauling it back to the house later in the day, between rain storms. I did get the recycle out on time, so that was good. Still, I got into a minor bit of trouble when I told Diane about my failure. Technically it was the dogs fault because neither of them woke me at 0530 like normal. Had they done so, I’m sure I could have beat the garbage man to the street. I’ll have to talk with them about that and reinforce it with a piece of cheese. There are a couple of other reasons I may have failed to remember those important chores that are worthy of mention. First, my iPhone 6 arrived yesterday and it was mandatory that I configure it and test all the functions I’ve been studying for the past 1.5 months. Second, my new glasses arrived from the VA facility that makes them, somewhere in Idaho. Boise, I think. There’s a little difference in the prescription so there was an adjustment period getting used to them. I hardly ran in to anything so it was a successful transition. The main problem is that they have transition lenses that require me to wobble my head around to focus on things because the magic little focus spots are a little off from my old ones.I got gold frames, which Diane doesn’t like on me, so I envision a trip to Costco in the near future to rectify that fashion failure on my part. I only chose them because I liked the nose cushion. It’s comfy. My new iPhone arrived while I was working on the other garage door. We have two of them. Diane’s has an automatic opener and mine is manual. Everyone should be very proud of me for taking the phone to my desk where I left it, all wrapped up, then went back to work on the door. My task was to attach a new seal to the bottom of the door. It’s kind of a problem because I got the kind that has an extruded aluminum bracket into which one must slide the seal after the bracket is mounted to the bottom of the door. Sounds easy, right. Well, I’m here to tell you it’s far from that. I did Diane’s garage door on Saturday and it about crippled my right hand all over again. The problem is that the rubber part arrives flat and must be formed into a “U” as it’s slid into the bracket channels and this covers the screws quite nicely. Looks good. But, the door must be completely open so the bottom of the door is located at the curve where the door goes horizontal so the bottom is not blocked by the frame in which the door rollers roll. Got it? Even then I had to undo the bottom roller on one side in order to clear the roller frame thing. With a little WD-40 and lots of effort I managed to push, yes, push, the rubber seal across the entire 10 foot span of the door. It was brutal and my right hand wasn’t working very well when I finished, but I got it done, by golly! So, yesterday I figured I’d make things easier by propping the door open, about chest high, then remove the bottom rollers from BOTH sides thereby allowing me to swing the bottom panel of the door into the garage where I could easily insert the rubber seal. I tied off the bottom rollers to heavy things I found on the garage floor to keep the door spring from coiling up and beating holes in the ceiling after being ripped from my grasp. On one side I used a trailer hitch and the other side had a propane tank attached. Everything was going nicely until I took the last screw out of the second roller bracket. At that exact moment I realized the error of my thinking as the door pushed the wood clamp I’d used to hold the door up aside as if it wasn’t there and slammed with a resounding crash to the floor. I’m sure it shook houses on both sides of us. On the way down it hit my sprained left wrist which hurt a bit, but I wasn’t concerned about that right then. I was waiting for the pain to race up my left from my left foot that I thought might be trapped under the door, but it never happened. Looking down I was relieved to see that my foot was actually OK. Right then Diane appeared in the door to the house and calmly asked if I was OK. Having already assessed myself for possible crippling injuries, I assured her that I actually was OK. Then, just to get it out of the way, I told her what had happened, she nodded knowingly, and retreated back into the house after suggesting that I call Jeff for help. I eventually did call Jeff, after re-learning that a 10 foot wide wood garage door that isn’t hooked to its spring weighs about a ton and a half, far beyond my limited lifting abilities. Once Jeff got here we managed, after a bit of testing, to get the door open and propped up so we could insert the rubber seal and put it all back together. However, noticing a small dent in one of the channels, into which the rubber gasket would slide, closer inspection revealed that nothing was going to slide through it. Ever. The door landed on some “things” that slammed those grooves shut tight in a number of places to the point where I knew the only way to make it neat was to get a new rubber gasket bracket. If I’d been thinking properly I would have reattached the bottom rollers, that are attached to the big spring, but I wasn’t so we didn’t. Instead, we lowered the door to the floor, gently, where it will reside until the new brackets arrive from wherever they’re made. Last night Diane went to play bunco with her friends so I was left along with strict instructions to not do anything that involved lifting heavy things, or plugging anything into a wall socket. That pretty much limited me to my new iPhone 6 which I opened and got it all set up for use. I worked on the puzzle we have living on a table, too. The pieces are very light so there was no danger of violating the lifting restriction. Now it’s Tuesday and I’m home alone again because Diane is working today. She didn’t leave me any instructions so I’m a little bit concerned about how I should conduct myself until her return. I’ll figure something out. It’d not raining very hard so maybe I’ll just go out and mow the yard.